It's time to vote! Scroll up to see the voting poll. Click here to see all of the amazing entries! Feel free to ask your neighbors, friends, and even your boss to vote, but remember, just one vote per person! Help us celebrate the spring season with COLOR! Thinking bright and colorful, choose a color palette that inspires you for spring. Your entry can use any materials you desire! The more colorful, the better, though! Perhaps you'll share a beautiful batch of Easter eggs you create with dye and washi tape. Maybe you'll make a gorgeous twirly rainbow skirt! Wanting to tackle the ONE really intricate coloring page that keeps taunting you? Fill it with color! Been wanting to redecorate your craft room with a rainbow theme? NOW is the time! 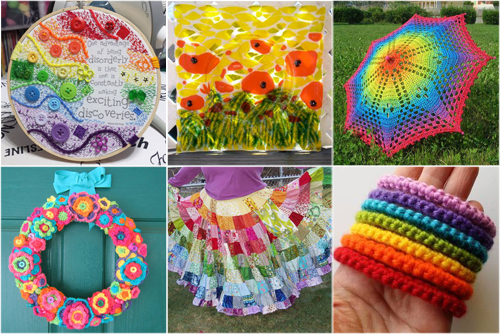 Here are some colorful projects to get your gears turning! Craft your project during this challenge period (March 5 - April 9, 2018) only. Projects created before this timeframe will be excluded from the voting poll. Post your craft during the period of April 2 - April 9 2018. No sooner. No later. On April 2, there will be a special folder created for entries. We will reply with the folder/board link here on this thread. Voting will happen from April 10 - April 17 2018. The winner will be officially announced on our first business Monday of the next month, in our monthly newsletter, on this thread, and on the Craftster blog! We will contact you via Private Message, after the announcement, to get your prize package information. 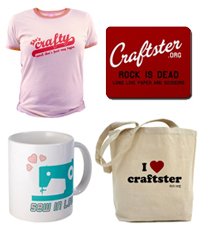 Their choice of any one item from one of Craftster's online shops! How perfect for spring! I am so ready for lots of this, thank you . Cool contest theme--I might participate, but I can't promise anything. Yay! I am excited to create some color. So tired of winter! Can I enter something that I've shared a progress photo of? I'm working on a custom doll who's going to be quite colorful when she's finished and would like to use her as an entry but I've shared a couple of progress photos of her in a thread. I understand if I can't use her and will try to come up with something else if need be. ETA: nevermind. I have to start from scratch with her except for a couple of minor details. I messed up her eyes pretty badly and her hair came off so it'll be like a whole new project. Oh my goodness, her eyes and hair. What happened? On the eyes, I didn't thin the acrylic paints enough. For her hair, I didn't let the glue dry long enough before I cling wrapped it to work on her face. I still haven't finished her, either I'm going to work on her some tonight and try to finish her. Maybe I'm missing it but I can't find the link for posting our entries. I don't think it's up yet. I'm sitting patiently on a very colourful project myself but I keep thinking, hmm, I've got time to make something else for another option, right? LOL . Sorry about that! I was still cleaning up unicorn fluff! Creating the board right now and I'll post a link here in a momento! It's time to enter! Good luck to all! To post your entry, please start a new topic for it on this board. Click NEW TOPIC on this board to post your entry! Entries must be posted by April 9, 11:59:59 PDT 2018.